Quincea–era Angela Ruelas stands with her doctor neonatologist Gerardo Sanchez and nurses at Valley Regional Medical Center Newborn Intensive Care Unit (NICU) in Brownsville where Angela received care as a newborn. BROWNSVILLE — The first time 14-year-old Angela Ruelas was in the Neonatal Intensive Care Unit at Valley Regional Medical Center in Brownsville, she was a premature newborn who weighed just 1 pound, 8 ounces. 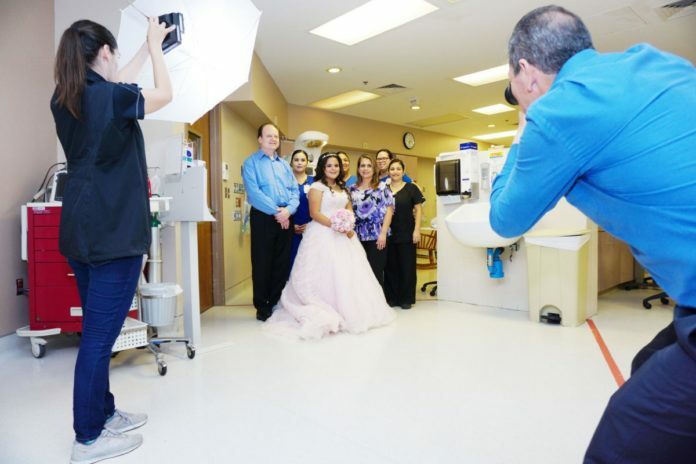 She returned to the NICU on Oct. 26, wearing a sparkling rose-pink ball gown, to have her quinceañera photos taken in the place where she spent the first three months of her life. Angela was born at 24 weeks, and her parents had the idea for photos where she received round-the-clock care until she was healthy enough to go home. The photo shoot was a celebration of how far she has come. Angela said she sees her nurses and neonatologist Gerardo Sanchez when the hospital hosts its NICU reunions, and she’s heard the stories about her early days in detail. They have been invited to her Nov. 30 quinceañera. “It’s amazing how everyone loves me so much, and I love them,” she said. Mom Vanessa Ruelas got emotional while reflecting on Angela’s birth. Most parents leave the hospital with their baby after a few days, but that wasn’t the case for her and her husband. Angela had frequent hospital visits after she went home — three or four times per year, Ruelas said — until she was 4 years old. About 250 infants are admitted to the Valley Regional Medical Center NICU each year. Sanchez said babies born at 24 weeks, like Angela, are among the sickest infants that receive care. Everything from their eyes and lungs to the kidneys and brain are underdeveloped, and those babies require round-the-clock care, he said. Nurse practitioner Libby de Leon was among hospital staff who cared for Angela as an infant. She and other nurses checked Angela’s vital signs and for respiratory problems, at times dedicating one nurse solely to Angela’s care. They also comforted her parents and kept them up-to-date, she added. During the photo shoot in the NICU, nurses brought out a cake for Angela that was complete with a sparkly crown. Women’s Services Director Karen Rhodes said a couple visiting their baby was excited to see Angela, comforted that their infant could grow and thrive as she did. “We’re honored to be a part of this,” Rhodes said.